Grilled Wild Salmon Salad is a wonderfully fresh and healthy main course salad ~ make it right on the stove top in a grill pan and enjoy all year long! Slice the entire head of romaine lettuce in half lengthwise. Leave the root intact so the leaves stay together. Heat a grill pan on medium high heat until quite hot. Brush it lightly with oil. Grill the thawed salmon fillets for about 2 -3 minutes on each side until the fish is just barely cooked through. Set aside. Set the romaine halves onto the hot grill, cut side down. Grill just long enough to get nice grill marks, about a minute or so. Set the lemon halves on the grill as well. Remove the lettuce to a serving platter, cut side UP, along with the lemon halves. Scatter the tomatoes, Parmesan, croutons, and parsley over the lettuce. Sprinkle liberally with pepper. 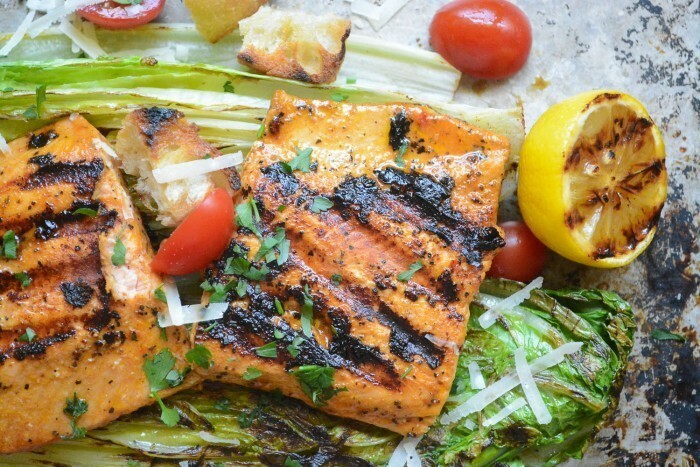 Top the lettuce with the salmon fillets. Drizzle with the Caesar dressing and serve immediately.